I love a sun-warm tomato fresh off the vine. Tomatoes are my favorite part of my garden, and for a couple of years, tomatoes and peppers were the main reason I gardened. I grow much more variety now, but tomatoes are still very important. This year I'm growing several varieties, and in greater quantity so I'll have some to can as well as to eat fresh. As summer has progressed they've all gone kind of crazy, not that I'm complaining at all. I wanted to replace the hybrid varieties I'd been growing the past couple of years. Hybrids are, of course, easier to find as transplants at the local stores. For two winters I'd brought in cuttings from my plants and kept them alive in water, planting them in the spring. It worked well, but this winter my cuttings died in the kitchen windowsill where they've usually thrived. It was a good opportunity to start over with new varieties. I bought new seeds, all heirlooms this time. First, I planted "homestead" tomatoes, 80 days to harvest. I chose this variety because it's supposed to be well-suited for hot and humid gardens. Homestead is a salad tomato, 6-8 ounces according to the catalog, although mine have been averaging about 2-3 ounces with the largest one I've picked weighing 4.2 ounces. Even the small ones are big enough to cut into four slices to put on a sandwich, or cut up into a salad. They were the first to turn orange and then red, at least two weeks before the other varieties. They are juicy and delicious with just enough sweetness and tartness. They are producing well right through the summer heat (although this year has been cooler than normal). Will I grow them again? Yes, I like these a lot. 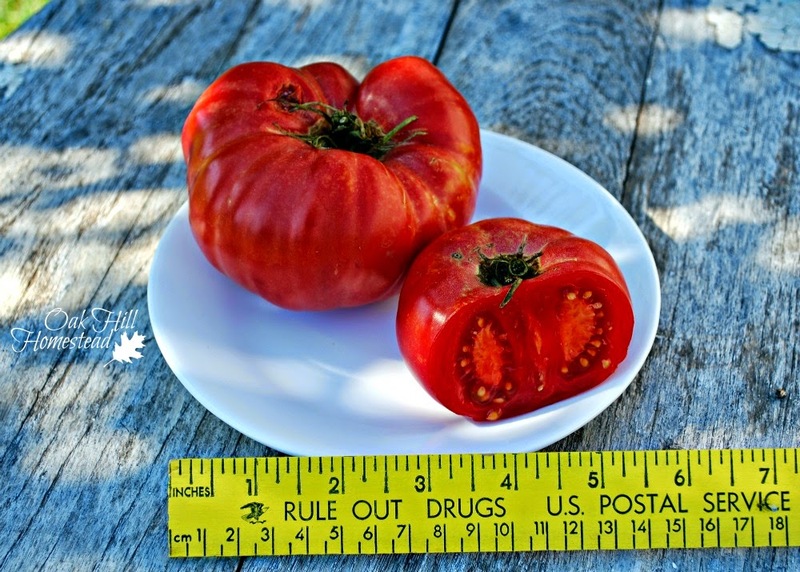 Did you know you can can tomatoes no matter what variety you're growing? You can! This is the first year I've grown a paste tomato; it's also the first time I've grown a determinate tomato. I chose "oroma," an heirloom, 70 days to harvest. Shortly after the homestead tomatoes started ripening, these started turning orange too. They were smaller than I expected at first, although now the ripe ones are larger, about five inches long. They are fighting blossom-end rot, even though they are planted right next to the other varieties that have no problems at all. Because they are paste tomatoes, they have thick, meaty walls and few seeds. At first I was struck by how dry they are, but being a paste tomato, that's how they're supposed to be. Mine are averaging a little over 3 ounces. Will I grow them again? Well, I do have more seeds, but they aren't "my favorite paste tomato" plus there's the whole blossom-end-rot thing that doesn't seem to bother the other tomato varieties I'm growing. I'll probably try something else in the future but I'll continue to use these seeds too. 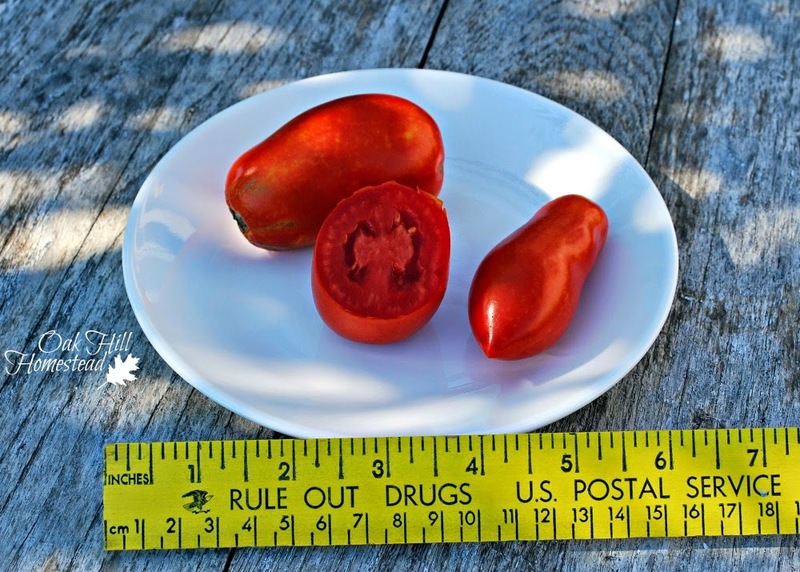 I love cherry tomatoes - I keep a bowl of them on the counter to snack on throughout the day, and I eat a handful of them whenever I'm in the garden. This year I chose "yellow pear" because so many people raved about them. It's also an indeterminate variety, 75-80 days to harvest. These are cute little things. I wish they had a little more "zing" to them, either tart or sweet, but they are still good. They are easy to pick, giving up the vine easily when touched, and a great producer. Mine are averaging about 0.3-0.4 ounces. They really are yellow like the photo above, not as orange as in the photo below. Will I grow them again? Yes, but I'll grow other varieties too. Mortgage lifter is the fourth variety I grew from seed this year. It's an indeterminate plant, 95 days to harvest. It was the last of all my plants to provide ripe tomatoes, but they are also much larger than I expected. Perhaps it's not officially a beefsteak tomato, but I call it that. They aren't the prettiest tomatoes, but they are meaty and delicious with a mild flavor. I've had some whoppers weighing 10 and 12 ounces. Supposedly it's a heavy producer, but the other varieties I'm growing have outproduced it so far. Most of them have this belly button-looking thingy on the bottom. Will I grow this kind again? Yes, but I'll grow other varieties too. I bought a four pack of "Arkansas traveler" tomatoes from the feed store, but only one survived. It's an indeterminate variety, 85 days to harvest. 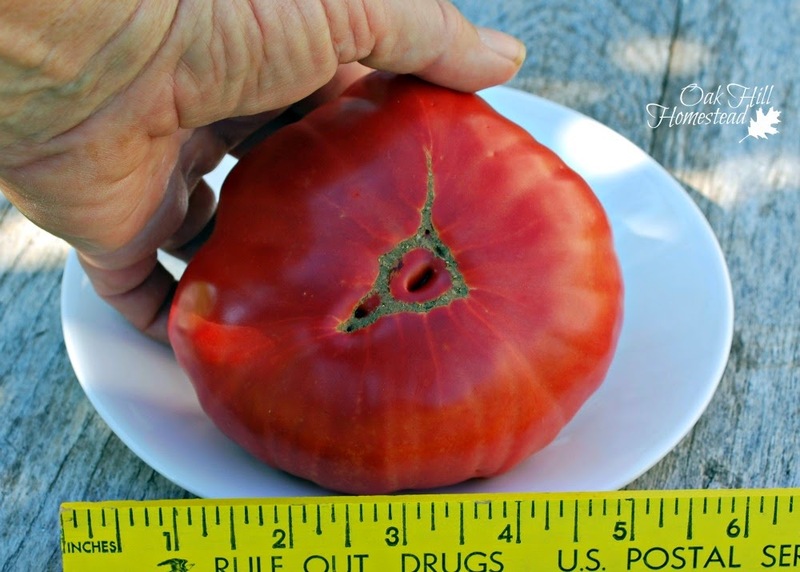 The description said it's a very old tomato that was historically grown in the south, and has fruits up to half a pound. I've babied the remaining plant along, but it's still far behind the other varieties in development and growth. Will I grow it again? I hope I'll get some tomatoes from it before the end of the season so I can decide whether or not it's one I want to grow again. I noticed this week that there are several clusters of flowers, so I'm more hopeful than I was. 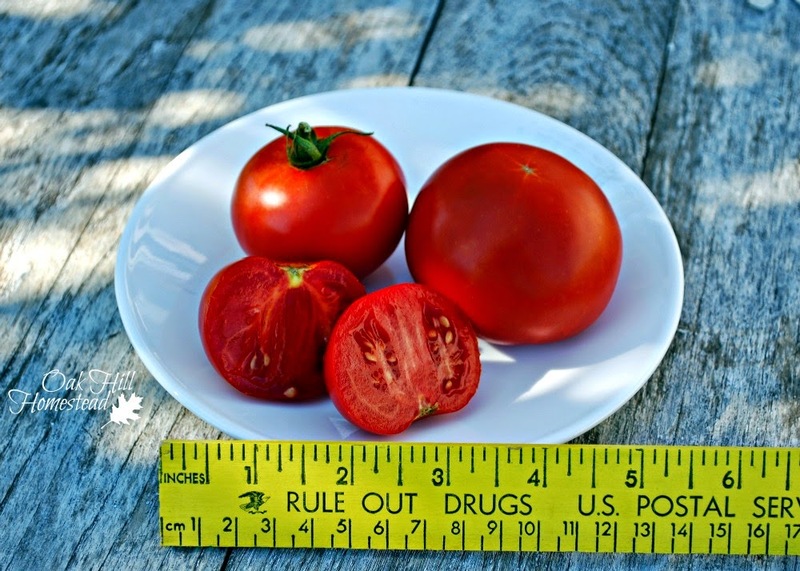 What is your favorite tomato variety? I hope you'll leave a comment and let us all know. I had Arkansas Traveler a couple of years ago and loved them! They are a pink tomato, I thought great flavor, couldn't find them this year. I am guessing the plants you got were just not a good quality plant, you should try them again! 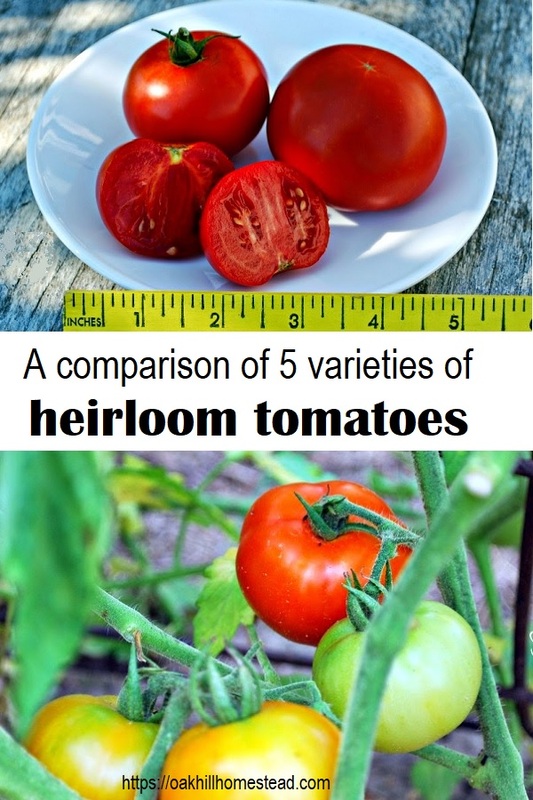 The heirlooms always seem slower to produce for me and as you said they don't look pretty, but fun to grow and usually a good flavor. I have heard of the mortgage lifter, but have not tried them. Thanks for this post, interesting!! Marilyn, I'm going to add the Arkansas traveler to my to-buy seed list and give it another try. This poor plant has gone through a lot. One of the dogs got hold of the four-pack and chewed up the other three; I found this one lying on the ground and replanted it in a pot. I kept it in the herb garden where I could give it more attention. The pot was then knocked off the shelf by a cat and I had to replant the poor thing again. Then the grasshoppers wanted to eat it. All in all, it's a wonder it's still alive, and I give it four stars for being so hardy! It deserves a second chance after all that. We planted Mortgage Lifter tomatoes this year as well. I saved seeds so we could plant them again next year. They did great for us as well. I was never impressed with the flavor of the pear-shaped yellow cherry tomatoes, either. The mortgage lifter looks a lot like cherokee purple, just a different color! I like them too, Tracy, they have a nice flavor. Oh Rebekah, I have some crushed egg shells that I give the chickens instead of oyster shells, I'll go out and sprinkle around the plants this afternoon! Thank you! I like Arkansas Travelers and Rutgers. They both have a nice meaty texture and do well for canned tomatoes, salsa, tomato sauce, or just plain eating. Thank you for the tomato review, Kathi. It's always good to see what other folks are growing. Fern, I noticed on one of your recent posts that you are growing Arkansas traveler. I grew Rutgers for several years, along with the hybrid Early Girl. I always bought transplants, and those two were easy to find. This year I got serious about growing my own from seed so I could have the heirloom varieties I want, and had pretty good success with that. Wow those are some tomatoes. That one is Huge! I love fresh tomatoes, they taste so much better then store ones. Fresh tomatoes are the greatest. And those little pear tomatoes sound good for salads. It would just add a little color. They really would add some color to a salad, Heidi. That almost-blandness wouldn't matter as much either if there were other well-flavored veggies in the salad. Great idea. Thank you for your suggestion. Great review of tomatoes. Have you ever tried the Celebrity variety? My farmer friend has great success with them and they are so delicious. I didn't have much luck with tomatoes this year, but will be soon planting some in the fall garden. Daisy, I've grown the hybrid celebrity tomatoes a few times in the past. They are quite good. Thank you for stopping by. Great review. I'm mainly an ornamental gardener but who doesn't love tomatoes. My husband bought me a raised bed this year to grow tomatoes. We don't have a ton of sun on our property and in PA the growing season isn't as long as others so I grew a few heirlooms and a couple of cherries. The cherries out performed the heirlooms. I think I'll try some bush determinate types next year. Patti, I've found that cherry tomatoes are really prolific and every variety I've ever grown has produced like crazy! I've not grown many flowers/ornamentals, but I'm really enjoying the few I have this year. Have to love a husband who buys you a raised bed for tomatoes. :-) You're a blessed woman. Your tomatoes look gorgeous! I actually like those paste tomatoes best for canning tomato sauce since they are so fleshy (and for salsa too)... We get so much rain, our tomatoes haven't done well recently. Yours look tasty :) Thanks for sharing! Thank you, Jes. I've been using those paste tomatoes to make tomato sauce, like you do. I always grow a lot of different varieties of tomatoes too. 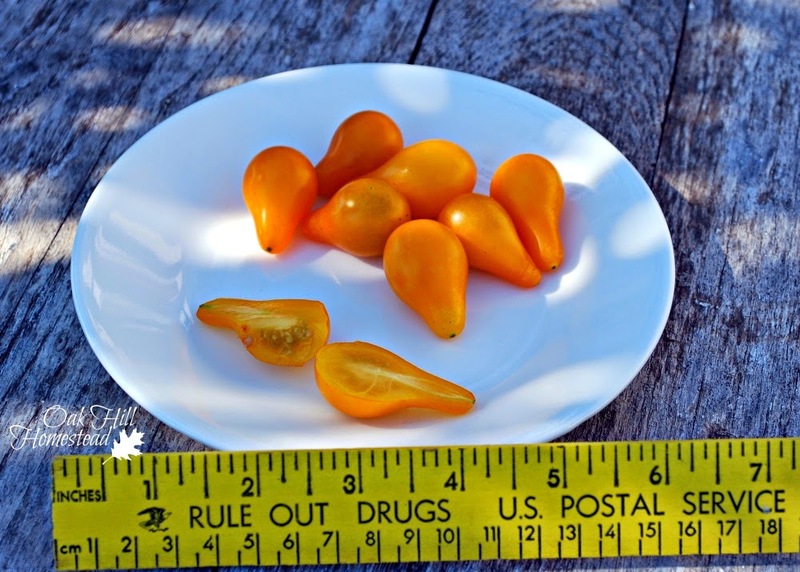 I love Mortgage Lifters, Yellow Mortgage Lifters, Hillybilly/Flame Tomatoes are my 3 favorite regular tomatoes, then I have my 2 oz tomatoes like black vernissage tomato and Bumblebee Tomatoes, then I love the Sunsugar yellow cherries. Those Mortgage Lifters are delicious! I haven't heard of the other varieties you're growing; there are so many more tomato varieties to sample, aren't there? I'm growing Sunsugar this year for the first time and am looking forward to tasting them.